Grammy award-winning artist T-Pain is known for many things. He's been an actor, a musician, a DJ and all-around star performer who happens to love his NS7FX and V7. He has collaborated with R. Kelly, Snoop Dog, Kanye West, Usher, Chris Brown and Britney Spears and many more. Numark: How did you get started in music? T-Pain: I got started in Tallahassee. I pretty much had a group of seven members and we were called The Nappy Heads. Just to make a little money and keep the studio running, that’s when I started Djing. You know, that got the money, that went into studio time and kept my studio going and here we are today! Numark: Who were your biggest inspirations coming up? T-Pain: The biggest was probably Cee Lo. You know, and when Ludacris came on, Eminem started influencing a little bit, Busta Rhymes was a big influence, Outkast, you know, the usual. Numark: When did you start DJing? 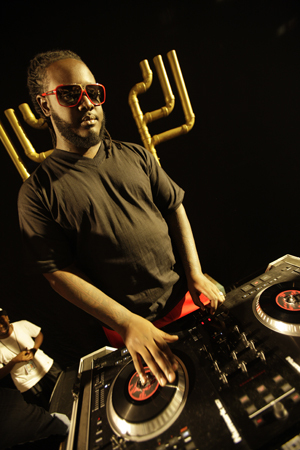 T-Pain: Actually I started DJing before I was doing music. I wasn’t “DJing”, DJing. My Dad had a record player in the house and I was always messing that up so, I consider that DJing. You know what I’m saying, before I was T-Pain I was DJ Pain. So you know, that was kind of in the earlier years. Numark: You could probably use just about any gear you want. What drew you to the NS7FX? T-Pain: The NS7 you know, seemed pretty put together you know what I’m saying? You see a lot of units that have two turntables and a mixer in it and it’s just crap. The NS7 first of all looks cool as hell so that drew me to it, for real. I started playing with it and it just caught me. I had to buy two of them right there. Numark: What features do you like most about the NS7FX? 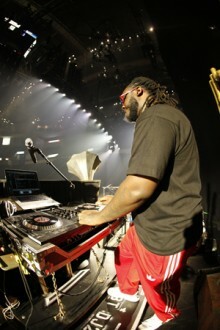 T-Pain: The features I like most are the bleep, I use a lot of the bleeping, and the loops. I really mess with the loops a lot you know what I’m saying? I do a lot of house clubs and a lot of techno DJing so the loops and bleeps come in very handy. Numark: And these are things that you weren’t able to do easily with what you had before? Numark: How would you say it’s changed the way you perform? T-Pain: It’s changed the way I perform tremendously because I’m so on point now, we got the synch, with tempos, you know I’m sold. I’m so flawless now that I can DJ anywhere. At first I could only DJ house parties and stuff because of my capabilities and I didn’t have a real accurate system. Now that it’s so accurate I can hit a couple of buttons and be right on point. Numark: What was it like when you found out you won your first Grammy? T-Pain: Oh, Man! It was kinda, It wasn’t as big as you would think it is because I won it before I got to the Grammys. So when I got there they were like, “Hey! You won a Grammy!” and I wanted to walk on stage and say something but you know, it wasn’t even on TV so it could’ve been bigger but it felt great. It’s fantastic to get a Grammy. Numark: Is there anyone you haven’t worked with yet and with whom you’d like to do a collaboration? T-Pain: Outkast. All the people I haven’t worked with yet that I’d really, really like to and I really want to sit in the studio with them for like five years and see what happens. We’d get some albums out of that. Numark: You have some of the coolest clothes ever. Especially those hats. Where do you find stuff like that? T-Pain: I get them made. Everywhere I go, I get an outfit, send them the fabric of the outfit, they make a hat to it and everything is custom. I actually don’t wear them anymore and I signed them and numbered them and put them on eBay and all the money is going to charities and foundations and stuff. Numark: How did you get involved in making an iPhone app? T-Pain: I saw Lil’ Wayne’s app first. I got kind of jealous and called around to a few people and asking, “How can I make my own app?” We threw around a few ideas and Auto-tune seemed to be the best thing to do at the time. You know it’s so popular, it was running around everywhere so why not make some money off of it? Numark: It seems like there’s nothing you can’t do. You’ve won all these awards, you become an actor. DJ, Performer, what’s next for you? T-Pain: Man, I can’t really say what’s next. Whatever God throws my way. You know. I’m just living. I don’t have the controls. It’s all about who has the remote. I can’t change the channel on my life. I’m just rolling along with the static. 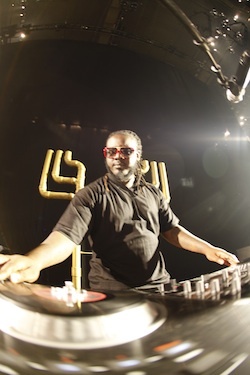 Numark: Tell us about how you got to be on the tour with Black Eyed Peas. T-Pain: The way I got involved was just begging. Just staying real persistent and keep begging everybody. You know, telling them, “Please let me on the tour. You won’t be disappointed.” I just let them know that I’m a standup guy you know what I’m saying? I follow the rules, and the first show we had they said, “Finally we got someone who knows what they’re doing on the tour.” so I feel great about that. Numark: There are a lot of aspiring DJs and musicians who look up to you. What advice do you have for them? T-Pain: My advice to them would be to just keep being you. Don’t worry about what everyone else is doing. Don’t worry about the stuff you hear. People fear what they don’t understand so if you’re doing something they don’t understand, of course they’re going to try to stop doing it or just bring you out of it or make you come do what they’re doing because they could be doing it better than you. I do recommend V7s or NS7FX you know. I recommend Numark completely. My first turntable was the CDX. I recommend all Numark. Just get it (laughs). Just get it because it will be worth your while. Trust me. It got me famous for DJing. I’m making all sorts of money around this country and others DJing. DJ Pain. Touring the world! ""The V7 and NS7FX have changed the way I perform tremendously because I’m so on point now, we got the sync, with tempos, you know I’m sold. I’m so flawless now that I can DJ anywhere.”"